Begin your research on Labor and Employment Law with these prominent treatises and study aids. This study guide focuses on Employment Discrimination issues using explanatory text with hypothetical problems and answers. 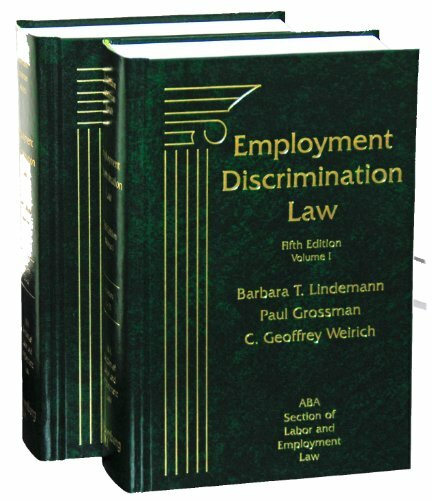 This study aid provides an overview of individual employee rights, by focusing on the problem areas, such as physical safety, privacy and reputation, discrimination, individual rights protections in collective action statutes, termination of employment, pensions, restrictive covenants, trade secrets, and a short chapter on remedies. This nutshell focuses on the laws surrounding discrimination in the workplace, such as the Civil Rights Act, ADEA, and the ADA. It identifies the basic models of proof, the terms and conditions of employment and defines the protected classes. Enforcement makes up the final section of this overview. This nutshell reviews the early regulations set up to guide employee-employer relations and provides an overview for the structure and procedure of the modern-day National Labor Relations Board (NLRB). Legal topics, such as picketing, employer responses, and the duty to bargain are included. Designed to clarify the complexity of laws surrounding employment discrimination, this study guide examines the recent case law on the topic. A study aid focused on common-law employment issues such as employment-at-will, employment contracts, employment torts, workplace privacy issues, and restrictive covenants. It also covers federal and state statutory workplace regulation, including topics like compensation, employee benefits, and workplace safety legislation. Understanding Labor Law by Douglas Ray et.al. This study aid focuses on management and labor in the private sector, dealing largely with the National Labor Relations Act, its interpretation, and application by federal courts and the NLRB. A treatise focused on federal and state laws on disability discrimination, it contains case analysis and examines the interaction of the ADA with other statutes. This is a leading treatise on labor and employment issues related to workplace discrimination. This hornbook examines current federal employment discrimination law, including claims, defenses, procedures, and remedies. This two-volume treatise is comprehensive in coverage. It is organized chronologically through the employment relationship, from formation, through terms and conditions of employment, to termination. This treatise is the most detailed work on labor law. The publication is devoted to the National Labor Relations Act, Employment Discrimination, Americans with Disabilities Act, Family and Medical Leave, Occupational Safety and Health, Arbitration, and general employment issues. Some sample checklists and forms are included. Bloomberg Law offers this treatise online as well as in print under the same title. The work focuses on federal and state laws on disability discrimination, it contains case analysis and examines the interaction of the ADA with other statutes.